What is spinal cord compression? Spinal cord compression is caused by any condition that puts pressure on your spinal cord. Your spinal cord is the bundle of nerves that carries messages back and forth from your brain to your muscles and other soft tissues. As your spinal cord travels down your back, it is protected by a stack of backbones called vertebrae. They also hold your body upright. 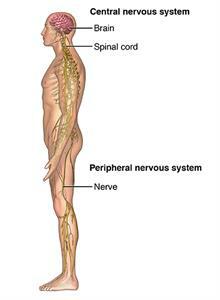 The nerves of your spinal cord run through the openings between the vertebrae and out to your muscles. 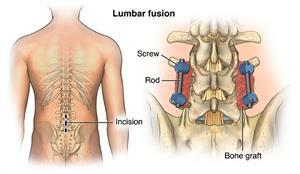 Spinal cord compression can occur anywhere from your neck (cervical spine) down to your lower back (lumbar spine). Symptoms include numbness, pain, and weakness. Depending on the cause of the compression, symptoms may develop suddenly or gradually, and they may require anything from supportive care to emergency surgery. What causes spinal cord compression? One of the most common causes of spinal cord compression is the gradual wear and tear on the bones of the spine, known as osteoarthritis. People who develop spinal cord compression from this are usually older than 50. What are the symptoms of spinal cord compression? 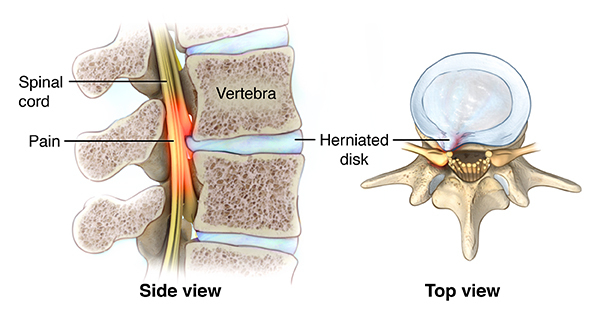 Symptoms of spinal cord compression can develop quickly or slowly, depending on the cause. Injuries may cause immediate symptoms. Tumors or infections may cause symptoms that develop over days or weeks. Wear and tear of the spine may take years to cause symptoms. How is spinal cord compression diagnosed? X-rays of your spine. These may show bone growths called spurs that push against spinal nerves. X-rays may also show an abnormal alignment of your spine. Special imaging tests of your spine. A CT or MRI scan will give a more detailed look at the spinal cord and the structures surrounding it. Other studies. These may include a bone scan, myelogram (a special X-ray or CT scan taken after injecting dye into the spinal column), and electromyography, or EMG, an electrical test of muscle activity. How is spinal cord compression treated? The medical team involved in treating your spinal cord compression may include arthritis specialists, bone surgeons, nerve specialists, and physical therapists. Treatment depends on the cause and your symptoms and may involve medication, physical therapy, injections, and surgery. Except in cases of emergency, such as cauda equina syndrome or a broken back, surgery is usually the last resort. Medicines may include nonsteroidal anti-inflammatory drugs (NSAIDs) that relieve pain and swelling, and steroid injections that reduce swelling. Physical therapy may include exercises to strengthen your back, abdominal, and leg muscles. You may learn how to do activities more safely. Braces to support your back or a cervical collar may also be helpful. Surgical treatments include removing bone spurs and widening the space between vertebrae. Other procedures may be done to relieve pressure on the spine or repair fractured vertebrae. The back may also be stabilized by fusing some of the vertebrae together. Some other treatments that may be helpful for some people include acupuncture and chiropractic care. Can spinal cord compression be prevented? Many causes of spinal cord compression can’t be prevented. You can help prevent symptoms of spinal cord compression caused by gradual wear and tear by keeping your back as strong and healthy as possible. Get regular exercise. Exercise strengthens the muscles that support your back and helps keep your spine flexible. Maintain good posture and learn how to safely lift heavy objects. Other good body mechanics include sleeping on a firm mattress and sitting in a chair that supports the natural curves of your back. Maintain a healthy weight. Excess weight puts more stress on your back and can contribute to developing symptoms of spinal compression. How is spinal cord compression managed? The best way to manage spinal cord compression is to learn as much as you can about your condition, work closely with your healthcare providers and caregivers, and take an active role in your treatment. Keep your back as healthy as possible by maintaining a healthy weight, practicing good body mechanics, and getting regular exercise. Simple home remedies like an ice bag, heating pad, massage, or a long hot shower can help reduce pain. The nutritional supplements glucosamine and chondroitin have been recommended as nutritional supplements for people with osteoarthritis, but recent studies have been disappointing. Ask your health care provider if he or she recommends any supplements for you and always discuss any alternative treatments or medicines you’d like to try. Spinal cord compression is caused by a condition that puts pressure on your spinal cord. Symptoms such as pain, numbness, or weakness in the arms, hands, legs, or feet can come on gradually or more suddenly, depending on the cause. Spinal cord compression can often be helped with medicines, physical therapy, or other treatments. Except in emergencies, surgery is usually a last resort.